Buy Latest technologgy sunflower oil producing making machine/edible oil pressing machine - Shandong Microwave Machinery Co.,Ltd. Latest technologgy sunflower oil producing making machine/edible oil pressing machine manuctured by Shandong Microwave Machinery Co.,Ltd. Latest technologgy sunflower oil producing making machine/edible oil pressing machine 10-500T/H oil material first cleaning,drying and storage section turn-key project. Latest technologgy sunflower oil producing making machine/edible oil pressing machine 100-3000 T/D oil pretreatment, shelling and pre-press workshop turnkey project (soybean hot peeling, bean skin crushing; the soybean extrusion, high oil contained pre-press cake extrusion, and high oil contained embryos puffed; of direct puffed). Leaching workshop turnkey project Latest technologgy sunflower oil producing making machine/edible oil pressing machine(Towline extractor, Rotocel extractor, loop type extractor, DTDC separated machine, the full negative pressure evaporation, paraffin wax recovery, leaching workshop degum, phospholipid concentrate). 30-1000T/D oil continuous grade two or one physical (chemical) refining Latest technologgy sunflower oil producing making machine/edible oil pressing machine. 10-200T/D Fatty acid esterification production Latest technologgy sunflower oil producing making machine/edible oil pressing machine. 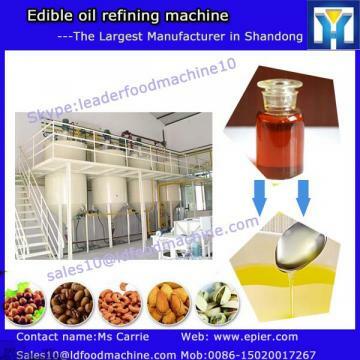 it aims to get rid of the impurity in the oil seeds and adjust the water content and temperature to make the oil seeds at the best condition to make oil. pressing: by physical squeezing to get natural oil,the oil nutrition wont be destoried.after pressing there would be 5-7% residue in the cake. solvent extraction is by using the solvent to dissolve the oil in the flakes to get miscella.and then separating the oil and the solvent,finally get crude oil. Extractor:the solvent extraction would react in the extractor for about 40-60minutes. condenser: to cool off the solvent and make it liquid. refining aims to refine the oil to make it better quality for sale. the oil is more suitable for people use,and economic enhances. Shandong Microwave Machinery Co.,Ltd.is a Edible oil refining machine factory specializing in the production of Latest technologgy sunflower oil producing making machine/edible oil pressing machine, scientific research,manufacturing,installation, commissioning.Shandong Microwave Machinery Co.,Ltd.can provide Edible oil refining machinecustomers with design and services of 1-2000 tons Latest technologgy sunflower oil producing making machine/edible oil pressing machine. Shandong Microwave Machinery Co.,Ltd. have finished hundreds of successful projects Edible oil refining machineover the years: peanut oil, soybean oil, rapeseed oil, cottonseed oil, sunflower oil, sesame oil, animal oil,grape seed oil, acer truncatum oil, peony seed oil, walnut oil, hemp seed oil, pine oil, tea seed oil, papaya oil, milk thistle seed, and other special type Edible oil refining machineoil. Shandong Microwave Machinery Co.,Ltd. have independent import and export department. Shandong Microwave Machinery Co.,Ltd. Edible oil refining machineequipment has been successfully exported to more than ten countries: Russia, Australia, India, Afghanistan, Cameroon,and so on.